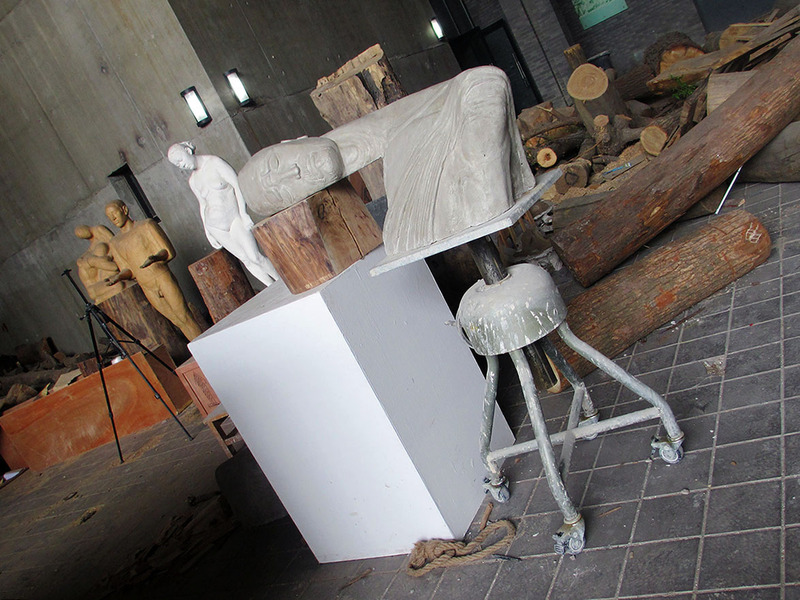 Wandering around the CAFA campus was great fun because there were a number of undergraduate student exhibitions scattered throughout. I stumbled upon the sculpture studio, and unfortunately the sculpture exhibition wouldn’t start until the week after, but I saw this piece and thought it was pretty great. I don’t know who the artist is since there was no label, but it’s pretty amazing, right? Part of me thinks it’s a self-portrait, but even if it’s not a direct self-portrait, I think all students, architects, and the like can sympathize. For my part, I’ve definitely fallen asleep in similarly awkward positions at my drafting table. Did you know you could play polo on bikes? Crazy cool. Thank you DAFF (the Design, Art & Fashion Fair at the West Bund a few weekends back) for introducing me to this sport. I will never actually participate in the sport since I can’t for the life of me ride a bike, but I’m glad I know it exists. I feel so up-to-date! 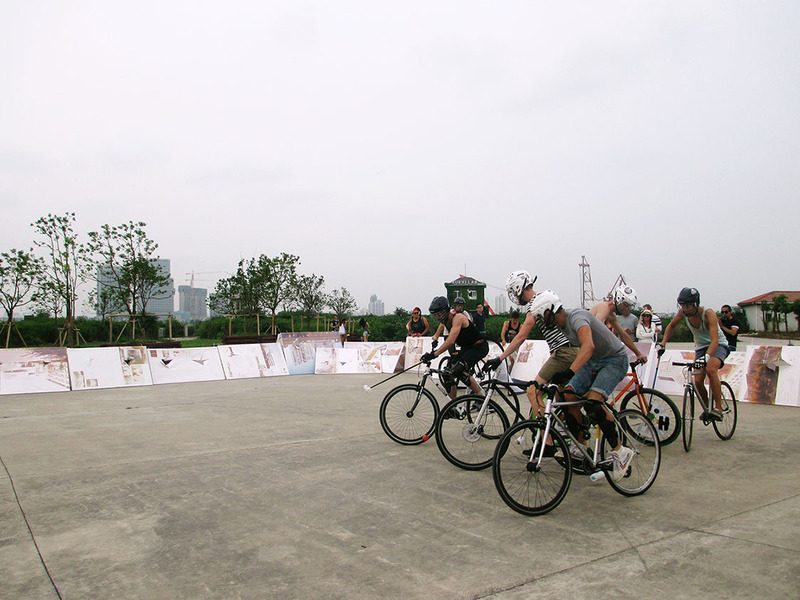 Although I’m not sure what I was more intrigued by: the game of cycle polo itself, that this was happening at a design fair, or that the court was bordered by architecture boards. 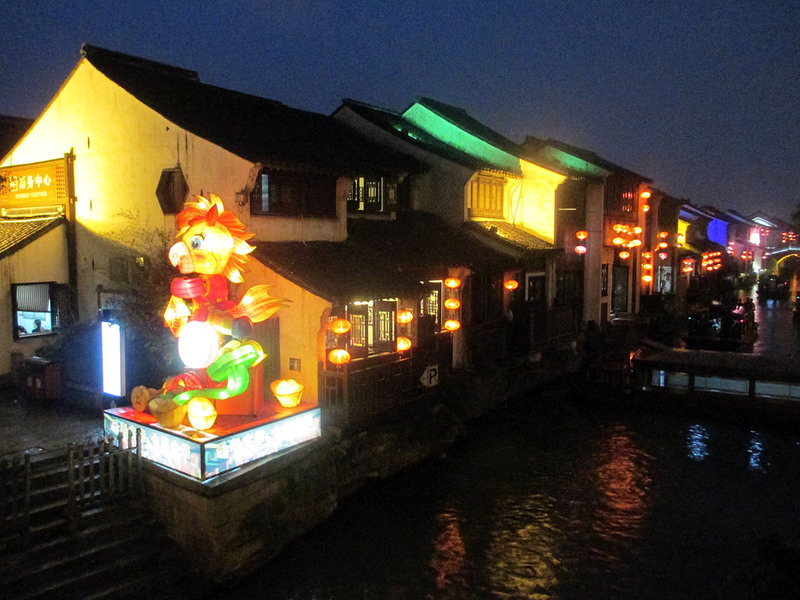 Downtown Suzhou is a historic area under cultural protection. Therefore there must be rainbow-colored lights and ridiculous lit-up sculptures! Oh of course. Welcome to China! In all seriousness though, Suzhou’s a lovely town with that crazy Chinese mix of really old and insanely new, and even though it’s quite close to Shanghai, it’s oh so much more peaceful. Old Suzhou has some pretty canals, bridges, and traditional architecture, but it also has that fake touristy sheen that most historic places in China have. It seems kind of unavoidable unfortunately. It’s a nice place to take a stroll though … if you don’t mind the crowds, if you don’t mind the same ol’ trinkets being hawked in every other shop, and if you don’t mind that you feel very little sense of actual history. Oy. It’s been crazy busy lately. A few weeks back I was in Beijing for work and caught the exhibition of postgraduate work at the CAFA (Central Academy of Fine Arts) Museum. Not sure if it’s still up or not, but it was definitely a treat. CAFA’s probably the best art school in the nation, and the student work was pretty darn amazing. 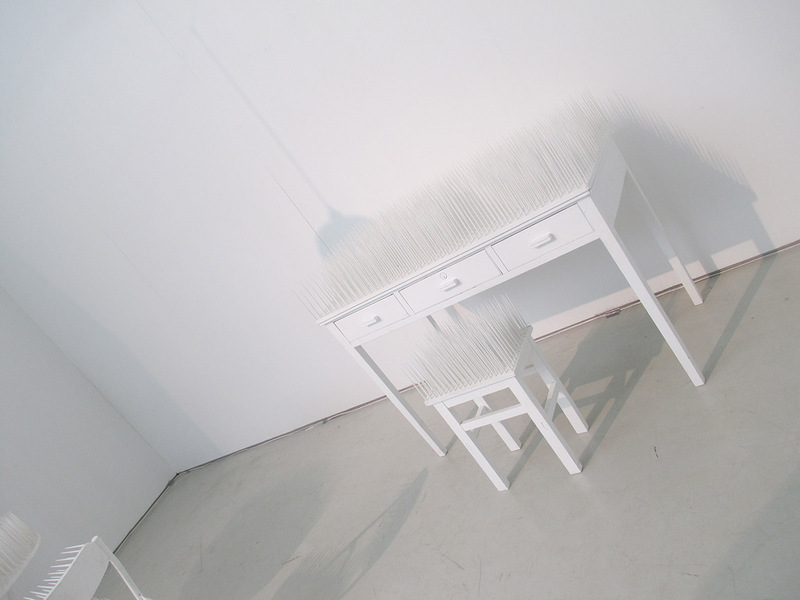 This installation consisted of ceramic spikes and ready-made furniture by Yang Zhou. I found it immensely appealing and eerily familiar since growing up, my room always had white walls and white furniture (in every single house). The use of understated furniture, the blank whiteness of it all, the spikes that almost look like grass and therefore somehow don’t seem that dangerous … it’s a quiet sort of terror that reminds me of The Virgin Suicides, that kind of whitewashed dread that lurks beneath every pretty facade. Lots more to show, stay tuned! k11 art mall. there’s art. in a mall. 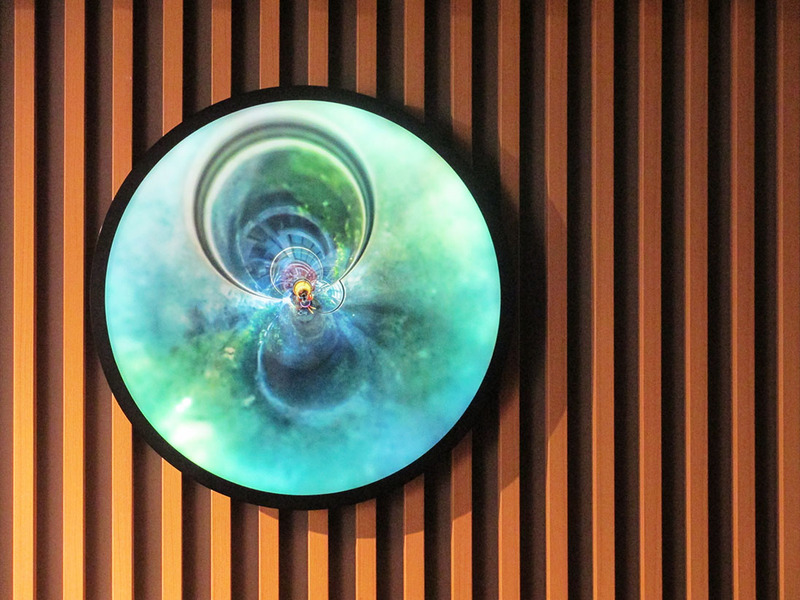 The K11 Art Mall in Shanghai is an offshoot of Hong Kong’s K11 Art Mall, and though I think the Hong Kong one is more successful in its incorporation of art pieces … whatevs. It’s a mall. A MALL. However artsy it is, the primary objective of a mall is to sell stuff (especially over-priced luxury stuff). Don’t get me wrong, I’m not completely knocking this art mall concept. It is great that it’s basically public art and you can wander around an he air-conditioned space and appreciate art without having to pay admission or venture way out into Pudong or the West Bund, but it’s still a mall. Perhaps it’s my prejudice against the archaic mall form (that’s led to ghost structures across America) or maybe I’m too idealistic, but I feel like the gaudy commercialism of a mall can’t help but tarnish fine art. Pretty, ain’t it? There is some nice art peppered throughout the floors, and it’s a bit like a treasure hunt trying to follow K11’s map and find all the pieces. Also, the mall does have a proper exhibition space in the basement, where there’s currently a Claude Monet exhibition that will close this Sunday. I haven’t gone and I doubt I will because A) the 100 RMB entrance fee is ridiculous for a single exhibition, B) I’ve seen Monet before so I’m good, and C) IT’S IN A MALL. 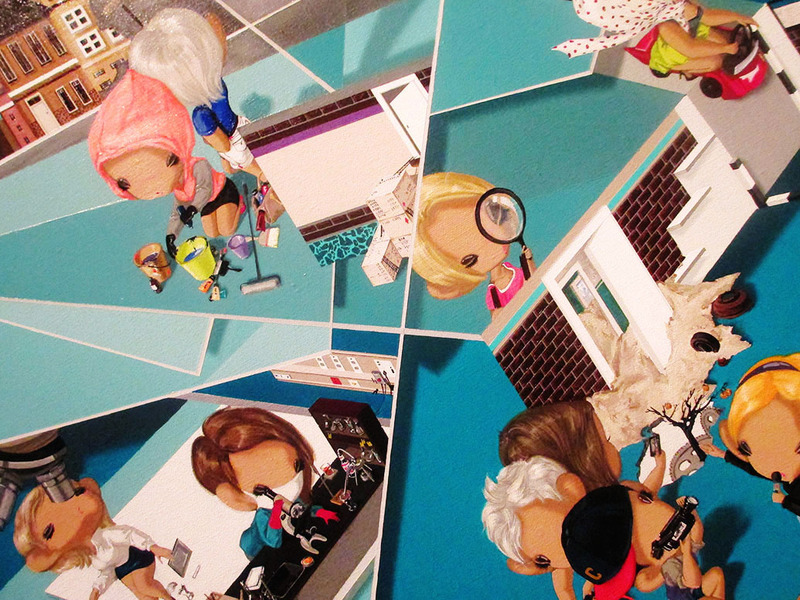 The group show is all about the animated, so it’s a mixed bag of artists and mediums – illustration, painting, video, sculpture, mixed media, et cetera. Not my cup of tea, but overall a good show. On the ground floor, Lu Yang’s Uterusman is weird and some of the paintings by Viki Lulu House (an artist collective) are just too cute, but I found the film Time of Cherry Blossoms by Tsai Shiucheng on the second floor was quite moving and the top floor’s Little Mona Lisa special exhibition interesting. I don’t have a favorite museum in Shanghai, but MOCA is pretty solid and definitely on the upper half of the list. And given all the new museums popping up around China, MOCA, which was established in 2005 and is located in People’s Park, is one of Shanghai’s more established art museums even though it’s not even ten years old. Crazy, right? Since it’s not a very big museum and doesn’t have a permanent collection, it doesn’t warrant multiple trips per exhibition for me, but I’ll look into getting a membership for next year regardless. Sigh … I miss having free admission to New York museums! loquats! so that’s what they are! I never knew what a loquat was until two weeks ago. Shocking, isn’t it? I think I might’ve heard of loquats before, but … that’s about it. When I took a daytrip to Suzhou a few weeks back with friends (because Suzhou’s only a half-hour train trip from Shanghai), I kept hearing references to 枇杷 (pípa). 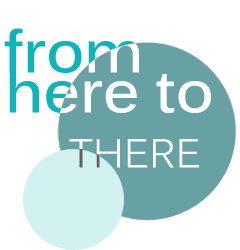 Er … what’s that? Oh, it’s a loquat. Er … what’s that? My friend’s father was driving us around Suzhou, so he pulled over to the side of the road and bought some. And then it was the group of us standing awkwardly on the side of the road holding these round yellowish-orange things like complete idiots. Uh, sir? How do you eat these? So now I know what a loquat is. 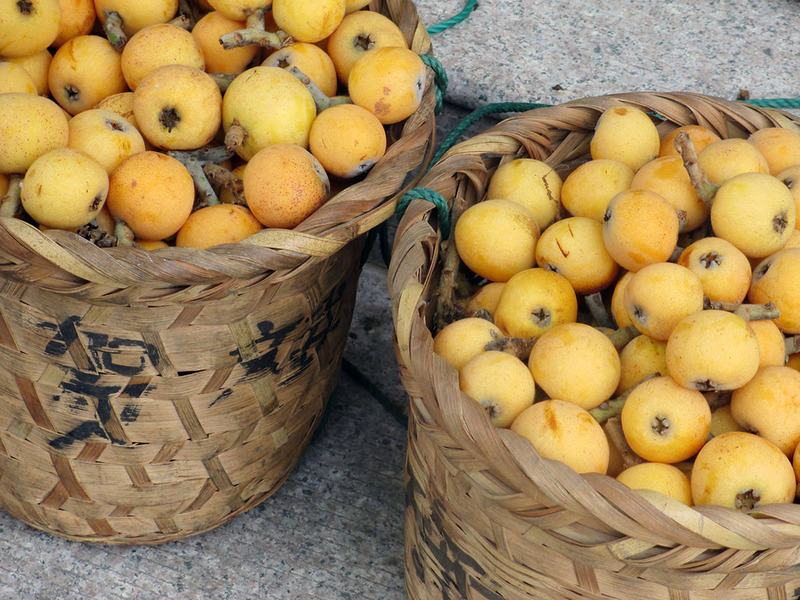 I know what a loquat is in Chinese. I know how to eat a loquat (the skin peels easily, then you eat the fleshy part around the large seeds in the center). And you know what else? I know that loquats grow on trees. Because we went up a hill and picked loquats. Neat.